Bus from Kuantan to Kangar is one of the most cost-effective mode of transportation to travel between the two cities. There is no flight service and train service between the route from Kuantan to Kangar. Therefore, bus become the only available public transportation to travel between the two cities. 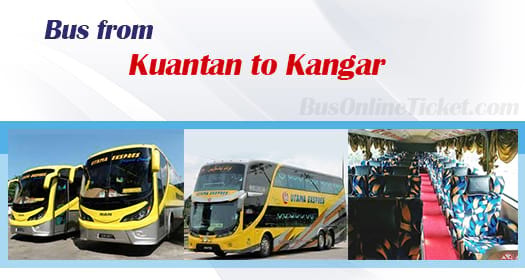 Utama Express is the only one bus service provider offering bus from Kuantan to Kangar. Utama Express provide limited schedule by having 1 daily departure from Kuantan to Kangar. The bus from Kuantan to Kangar provided by Utama Express is at night 9:00pm. Utama Express is one of the most reputable and influential bus operators based in Kuantan. All the buses deployed by Utama Express are fully equipped with air-conditioner and spacious seats. The bus journey from Kuantan to Kangar needs about 11 hours depending on the road traffic and weather condition. Utama Express deploys luxury double deck VIP coach to serve the passengers in order for them to have comfortable trip during this long hour journey. As for the long-distance journey from Kuantan to Kangar, two stopovers will be given for passengers to go for washroom or buy some snacks. Additional break will be given upon request from the driver during the journey. The bus fare from Kuantan to Kangar is reasonably charged at RM 68.80. The boarding point for bus going to Kangar from Kuantan is located at Kuantan Sentral Bus Terminal. The arrival point in Kangar is located at Kangar Bus Terminal. Booking bus ticket online with BusOnlineTicket.com is easy and convenient. Everyone could avoid any hassle from getting down to the bus terminal to buy bus ticket in long queue counter. Instant email confirmation upon payment is done.